A rather shorter report this time. Most of the July meeting was devoted to a debrief of the recent Chatham Exhibition, where Lighterman's Yard (apparently now nicknamed "The Yard", to sidestep the apostrophe controversy) made its first appearance at a major public exhibition. Though that's not strictly accurate - it appeared at Warley some years ago, in a rather unfinished state. The numerous invitations to other exhibitions suggest that it was a successful debut, and threaten a busy time over the next couple of years. There were a few issues from points and uncoupling that needed attention - some were fixed during the meeting, others postponed for later. Various organisational issues were discussed for future shows - transport, manning, funding, and communal toolbox being the main ones. 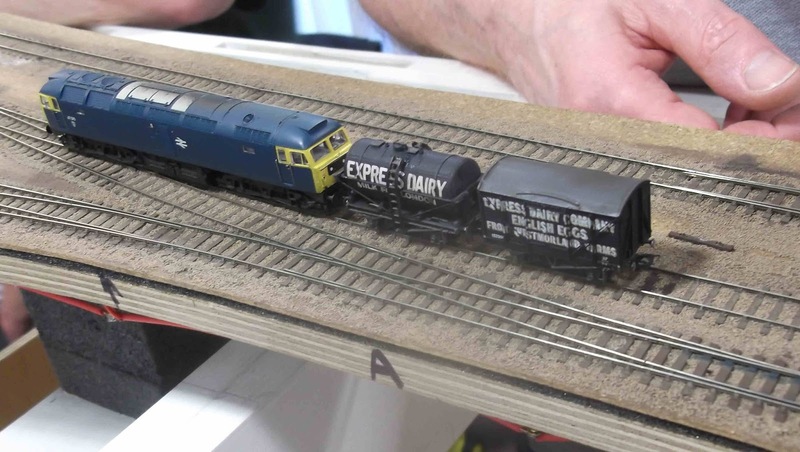 David Smith brought along this model which had started life as a recent Farish class 47. The body was lowered, the bogies were narrowed, and detailing was added - new handrails, doors and roof fans. Despite heavily weathered wheels it ran well. A cast body from a master made by David Smith. 3mm scale, so even if it had bogies they probably wouldn't fit on the track. Checking the track, using the Class 47 and a couple of vehicles from the dairy dock. Whilst a layout is never complete, the Yard doesn't have much left on the "must do" list - mainly completing the ballasting, building the last warehouse, and training the operators. So "working on the layout" probably won't be such a central feature of future meetings. A wagon-building workshop is planned for the next couple of meetings (though this has the stated aim of providing extra rolling stock for the layout). So now is probably a suitable time to repeat the invitation to prospective members to come along and see what goes on here. Volunteer operators will be particularly welcome, but all aspects of 2mm modelling will be discussed.